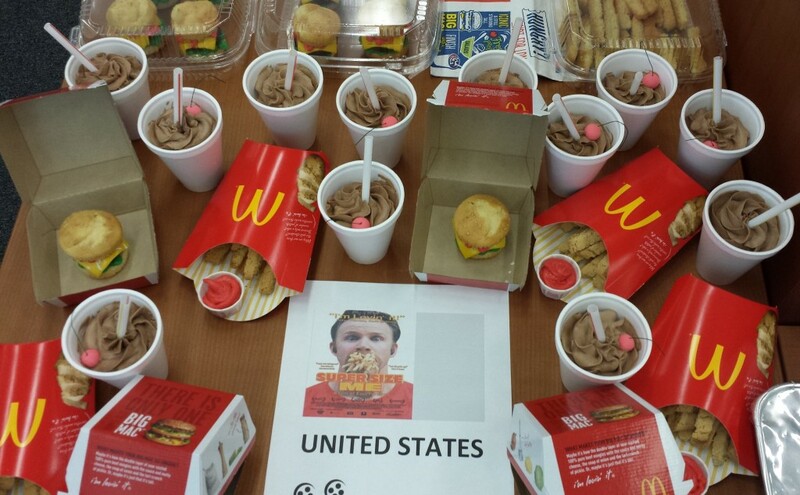 Once he said the theme was USA and “Super Size Me,” it was clear I had to make burgers and fries and shakes in baked goods form. 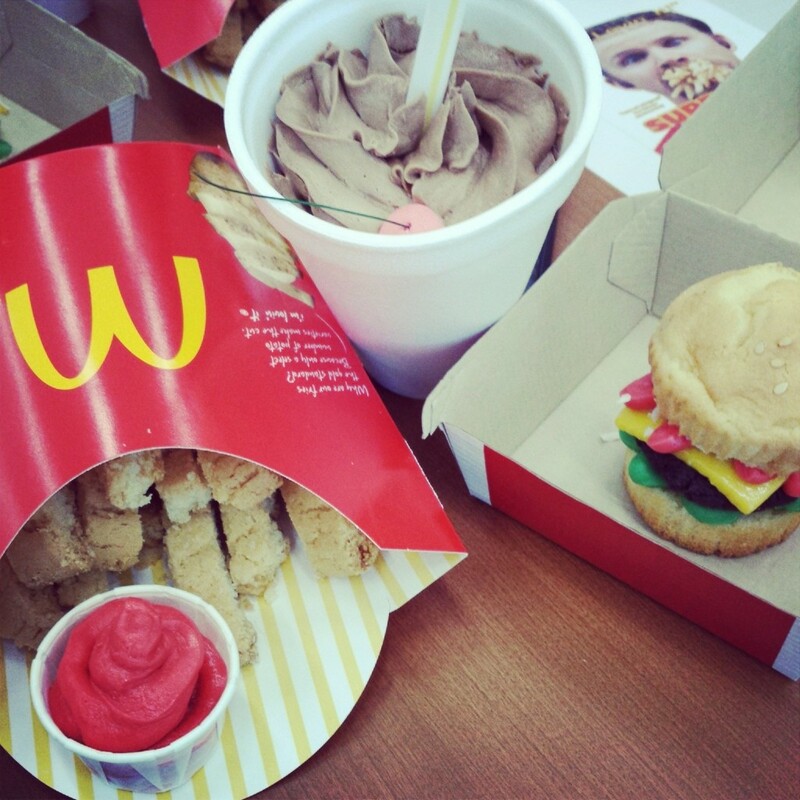 What is more American than McDonald’sTM fast food? I mean, the only thing that would be more patriotic would to make little red, white and blue flags on toothpicks and stick them in the burgers. 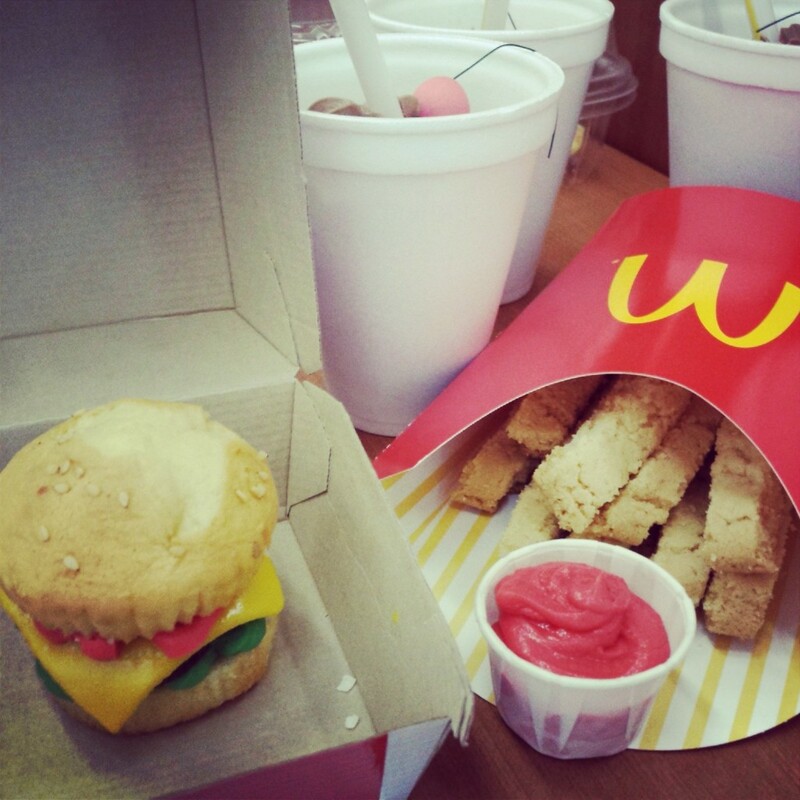 I suggested making the little sliders out of cupcakes, sticking a cupcake in a cup and swirling frosting on it and sticking a straw in for the shakes, and cutting up pound cake into strips and toasting them a bit for fries. To take it to the next level, my uncle suggested that we go to McD’s and get empty burger boxes and fry containers for the full effect. Our great ideas just played off each other. I mean, honestly, if we’re not in it to win it*, why do it at all, right? I sketched everything and planned it out in my little cake notebook. The burger buns would be sliced vanilla cupcakes with sesame seeds sprinkled on top, the patties would be mashed up chocolate cake ball filling, cheese slices would be cut from yellow marshmallow fondant, chopped coconut flakes would look like chopped onions, and green and red frosting would be perfect for the lettuce and ketchup. I just stuck the non-sesame seeded cupcakes in little Styrofoam cups and swirled whipped chocolate frosting on top so it looked like a soft serve shake. I even found signature McDonald’s red, yellow and white straws to stick in the cups. And I took it to the next level by rolling out little red fondant cherries to pop on top. It didn’t look right just leaving a little red ball on the chocolate, so I took plant wire and hooked it into the cherries so it looked somewhat more like the actual fruit. My original plan for the fries was to take the easy way out and just buy a ready-made pound cake from the supermarket, slice super thin fry strips, and toast them in the oven for a bit to get some grill marks. Unfortunately, when I DID go to the supermarket, they were out of pound cake. I just printed out the first generic cookie recipe that popped up in my Google search and baked a couple trays of giant cookies. It wasn’t the right recipe for the effect, but I just chopped them up into strips because I needed fries of SOME sort to bring in. I don’t think I mixed the flour well enough since these came out more like biscotti… eh, they were still tasty. I started assembling the little burgers, one ingredient at a time. The vanilla “buns” had cooled, so I removed all the wrappers and sliced them all in half. About 8 oz. of leftover chocolate cake went in the Ninja to be processed into chocolate cake powder, and I added a couple dollops of chocolate frosting to mash up the “meat” for the burger patties. Rolling them in a ball and then smashing them in the palm of my hand gave the perfect effect for the burger edges; they were a little jagged and looked like homemade well done pieces of cooked ground beef. I rolled out some marshmallow fondant and added a golden yellow gel to match the perfect color of processed American cheese. I cut out small squares and softened the edges with my fingers, and once I placed them on the patties… it looked pretty damn close to cheese. I left the cheeseburger sliders as is because I didn’t want to get the frosting all messed up in transport. I filled a pastry bag with red frosting and another with green and sealed them off with rubber bands. I’d just pipe the edges above and beneath the patty, and BOOM… instant “lettuce and ketchup”. I chopped up some dried coconut flakes and put them in a small baggy to add “chopped onions” on the burgers the next day. Packing all these confectionery delights in one bag on the train was going to be complicated. 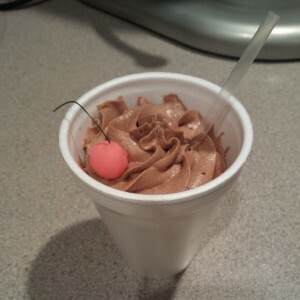 I debated whether or not to put the chocolate swirls in the styro cups now or at the office. As a test, I squeezed a dozen of the cupcake filled cups in a box that fit PERFECTLY in my trusty baking tote, and they all fit. I closed the box tops to make sure they wouldn’t touch the frosting, and it looked like a winner. I stacked the bare cheeseburger cupcakes at the bottom, along with parchment paper, scissors, the bag of coconut flakes, and the pastry bags with red and green frosting. The box o’ milkshakes was next, and to keep the top closed, I put the box of cookie fries on top. Everything barely fit in the tote bag. The secret to transporting all these uniquely shaped goods: don’t look at them or even THINK about peeking until you get to your destination. No stress, all zen. Luckily, the “out of sight, out of mind” BS thinking worked because the soft serve desserts were completely intact. 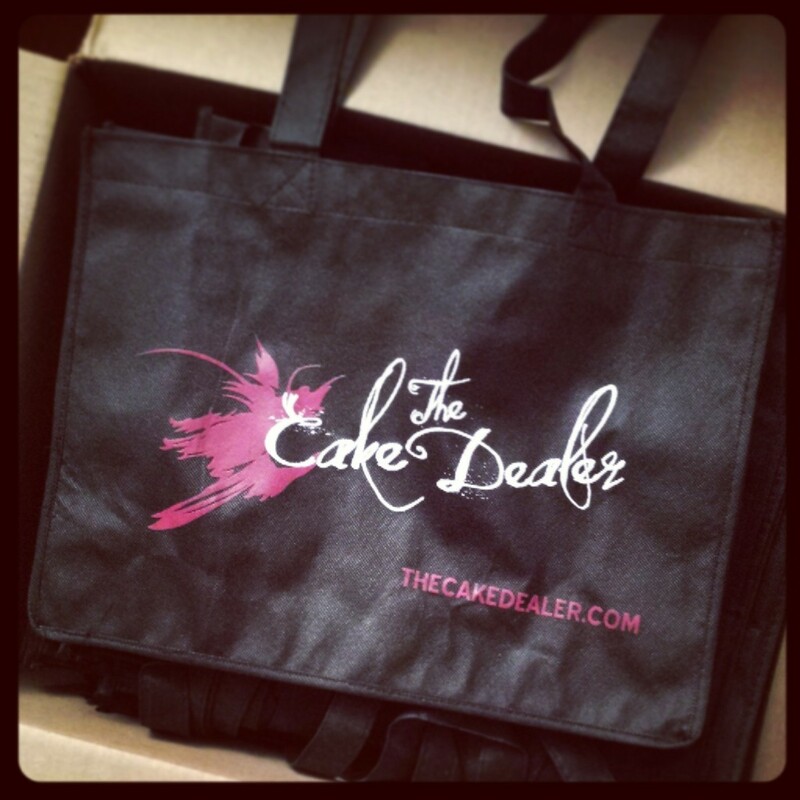 Sweet @ss bags with The Cake Dealer logo! Too bad all this wouldn’t fit in THIS new bag. I finally got the balls to get legit swag made, and I found a great printing company in CA that gave me a really good deal. Vin’s bro helped rearrange my logo and web link and within a couple weeks, a giant box full of beautifully printed Cake Dealer bags was waiting @ my doorstep. For reals, they looked hhhhhot. Hello, Christmas gifts for F&F! Back in contest mode: I walked over to my uncle’s office, a prestigious and iconic NYC news establishment, and we headed to the cafeteria to raid the food packaging section. We got a couple trays and plastic clamshells for the items that wouldn’t fit in the official Golden Arches fry and burger boxes. My uncle brought me to the food display area, and we were given prime real estate on a corner. When the contest organizer saw that we were setting up and how utterly awesome everything looked, he gave us more space and kinda shoved one person’s tag over. I was told we’d be given a 2 foot by 2 foot space to display everything, but we got more like 2 by 3 feet. Score! I laid out the parchment paper and got to work assembling the sliders while he put the fries in the boxes and inserted the straws in the shakes. When I put the entire thing together and took the top and bottom of the bun off to add the “ketchup” and “lettuce” in my uncle’s office, he was showing the sliders off to everyone who walked past and was like, “Doesn’t that look like perfectly melted cheese?” and ppl were like, “Ahhh, that’s so real looking!” The finishing touch was squirting red frosting in actual ketchup cups swiped from McDonald’s so one could dip their delicious French fries in one’s own condiment cup. Yeah, I totally dominate fake dairy, dude. Uncle S and I spent a good while arranging our display so that the best side of each dessert would be showcased, which was extremely difficult to do when EVERYTHING looked just absolutely freaking spectacular. Haha People came by and snapped pics and said the judges would be all over this. I left to go back to work, and an hour later my uncle said I won and had totally upped the game for next year’s holiday party. The prizes? A fancy Michael White cookbook… and bragging rights, of course. Wow. Your are amazingly talented. I happened to be reading about your apartment in today’s NYT when I clicked on to the link to your baking site. As someone not inclined to cake decorating I cannot believe my eyes at the creativity and beauty. Good luck!! !